Nag Tibba is a classic three days hike from Queen of Hillls, Mussorie. Nag Tibba is at the altitude of around 10,000 feet filled with dense deoadar and oak forests which are also host of rich variety of bird and wild life. We will come across the village of Lakhamandal, which is said to the place where Kauravas tried to immolate Pandavas in Wax house in the times of Mahabharata. (approx. 5000 years ago). We will come across some buddhist settlements and some shepherds enclosures and grazing sites. Stay careful as this trail is sanctuary for Himalayan Black Bears and Wild Boars too. 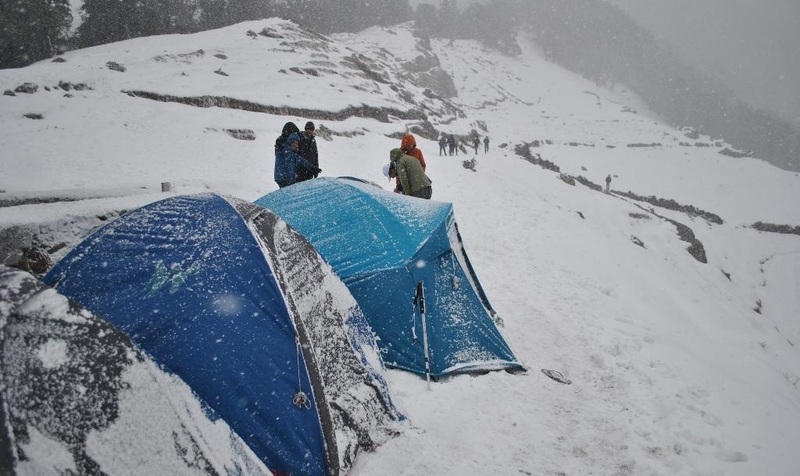 Nag Tibba can be considered one of the best weekend trails, you will come across snow clad mountain peaks and get to camp under starry night skies. There are excellent views of nearby mountain peaks such as Bandarpoonch, Kedarnath Peak, Gangotri Peak, Chanabang, Swargarohini, Srikanth, Black Peak and breath-taking views of the Doon Valley. This trek will also provide you a unique opportunity to experience the unique Garhwali lifestyle. On our way down we will come across a contrasting landscape of Oak, Rhododendron and Cider forests. We will be experiencing wet feet as there will be a stream crossing at the trek's end. The trekkers will enjoy the privilege of camping at beautiful meadows amid thick jungles. It's an easy trail for all age groups and moderate fitness levels. Nag Tibba Trek can be undertaken during entire winter season. It is believed to be the abode of Nag Devta or Serpent God, hence the name. There's a temple of Nag Devta where villagers come to pay obeisance for protection of their cattle. Mussorie is just 275 kilometers from the National Capital of New Delhi, thus making it an ideal weekend getaway for Delhiites. Upon arrival, we can shop and eat around at the Mall Road which is a shoppers delight, with numerous shops, restaurants and cafes. There is no dearth of places of entertainment in Mussorie. We will also go sightseeing across Camel's Top, Library, Gun Hill, St Mary's Church and Lal Tibba before going back to our rooms for dinner and rest. Enjoy chilling weather with barbecue and bon-fire. Pantwari is a small village located about 50 kilometers from Mussorie, and is nearly 3 hours drive. We will start early in the morning for our drive towards Pantwari via Kempty Falls. Pantwari is located at 1400 meters altitude and is the starting point of our trek. As we start our walk on a cemented path, from the main village market we will come across Nag Tibba Temple a small shrine located among thick deodar trees. After paying homage to the temple we will climb the forested slope across the magnificent views on a 4-5 hour trail towards Nag Tibba Base. Enjoy sumptuous food and bon-fire as we camp here tonight amid blue skies. We woke up in the morning to the chirping of birds and enjoy a nutritious early morning breakfast before starting our ascent to Nag Tibba top. The views are majestic here as snow clad mountains greet us. We can see ranges of Garhwal and Himachal. We will get to see famous views of Swargarohini, Bandarpoonch, Neelkanth, Black Peak and beautiful views of Doon Valley. After lunch we will begin our descent back to the base camp via the same route and then towards Pantwari where our taxis will be waiting for you to transport you back to your hotel in mussorie with wonderful memories.